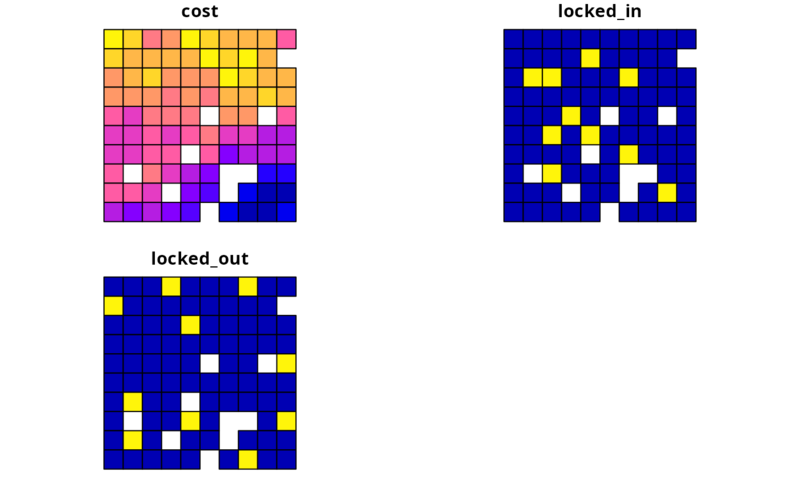 Simulated data for making spatial prioritizations. Planning units are represented as raster data. Pixel values indicate planning unit cost and NA values indicate that a pixel is not a planning unit. Planning units are represented as raster stack data. Each layer indicates the cost for a different management zone. Pixels with NA values in a given zone indicate that a planning unit cannot be allocated to that zone in a solution. 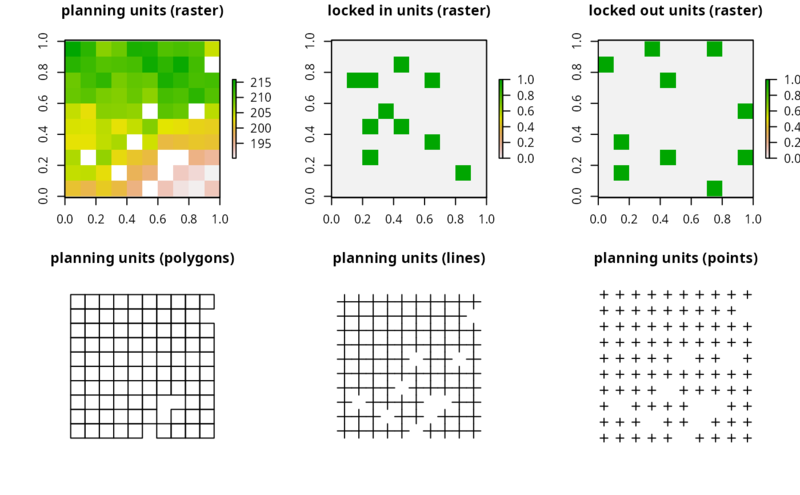 Additionally, pixels with NA values in all layers are not a planning unit. Planning units are represented as raster data. Pixel values are binary and indicate if planning units should be locked in to the solution. Planning units are represented as raster data. Pixel values are binary and indicate if planning units should be locked out from the solution. Planning units represented as polygon data. The attribute table contains fields (columns) indicating the expenditure required for prioritizing each planning unit ("cost" field), if the planning units should be selected in the solution ("locked_in" field), and if the planning units should never be selected in the solution ("locked_out" field). Planning units represented as point data. The attribute table follows the same conventions as for sim_pu_polygons. Planning units represented as line data. The attribute table follows the same conventions as for sim_pu_polygons. Planning units represented as polygon data. The attribute table contains fields (columns) indicating the expenditure required for prioritizing each planning unit under different management zones ("cost_1", "cost_2", and "cost_3" fields), and a series of fields indicating the value that each planning unit that should be assigned in the solution ("locked_1", "locked_2", "locked_3" fields). In these locked fields, planning units that should not be locked to a specific value are assigned a NA value. The simulated distribution of ten species. 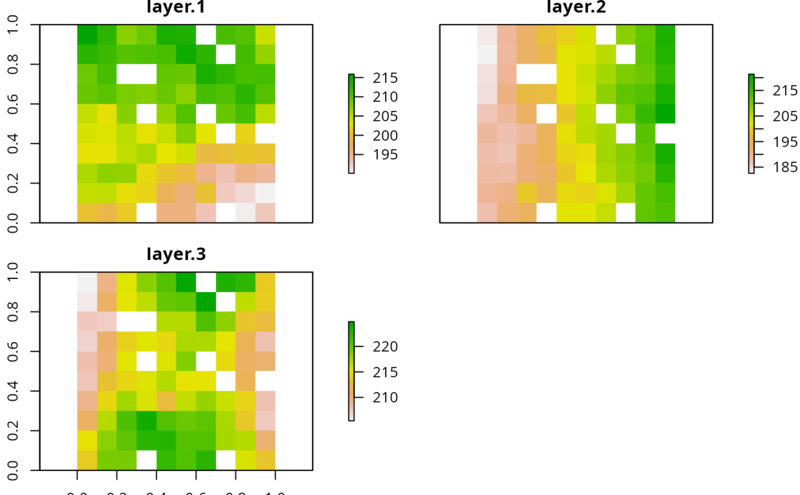 Pixel values indicate habitat suitability. 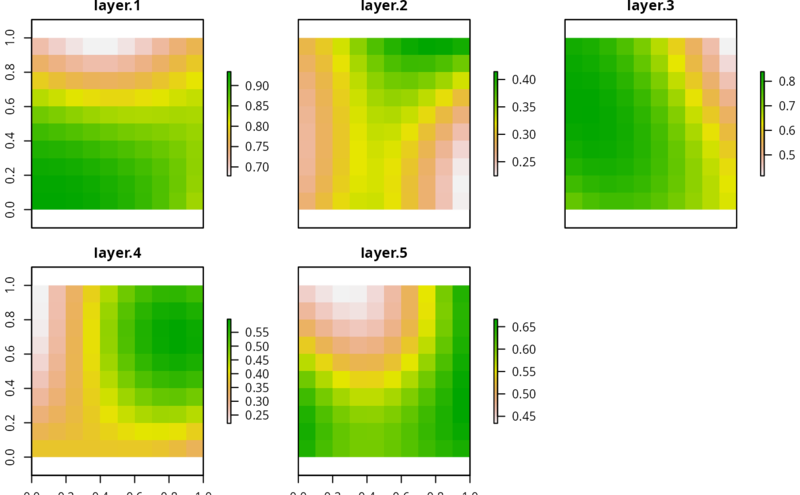 The simulated distribution for five species under three different management zones. The phylogenetic tree for the ten species.